Solar Cells | Genesis Nanotechnology, Inc. 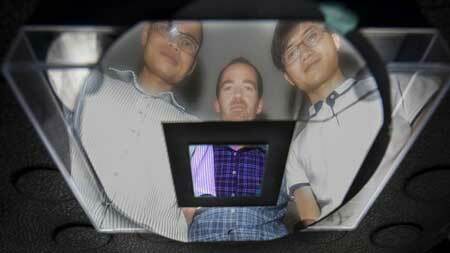 Researchers at The Australian National University (ANU) have found a new way to fabricate high efficiency semi-transparent perovskite solar cells in a breakthrough that could lead to more efficient and cheaper solar electricity (Advanced Energy Materials, “Efficient Indium-Doped TiOxElectron Transport Layers for High-Performance Perovskite Solar Cells and Perovskite-Silicon Tandems”). Dr Tom White from the ANU Research School of Engineering said the new fabrication method significantly improved the performance of perovskite solar cells, which can combine with conventional silicon solar cells to produce more efficient solar electricity. ANU Ph.D. student The Duong, Dr.Tom White and Ph.D. student Jun Peng. He said perovskite solar cells were extremely good at making electricity from visible light – blue, green and red – while conventional silicon solar cells were more efficient at converting infrared light into electricity. “The prospect of adding a few additional processing steps at the end of a silicon cell production line to make perovskite cells is very exciting and could boost solar efficiency from 25 per cent to 30 per cent,” Dr White said. While perovskite cells can improve efficiency, they are not yet stable enough to be used on rooftops. Dr White said the new fabrication technique could help develop more reliable perovskite cells. The new fabrication method involves adding a small amount of the element indium into one of the cell layers during fabrication. That could increase the cell’s power output by as much as 25 per cent. “We have been able to achieve a record efficiency of 16.6 per cent for a semi-transparent perovskite cell, and 24.5 per cent for a perovskite-silicon tandem, which is one of the highest efficiencies reported for this type of cell,” said Dr White. Dr White said the research placed ANU in a small group of labs around the world with the capability to improve silicon solar cell efficiency using perovskites. The development builds on the state-of-the-art silicon cell research at ANU and is part of a $12.2 million “High-efficiency silicon/perovskite solar cells” project led by University of New South Wales and supported by $3.6 million of funding from the Australian Renewable Energy Agency. Research partners include Monash University, Arizona State University, Suntech R&D Australia Pty Ltd and Trina Solar. A team of scientists at Royal Melbourne Institute of Technology in Australia has announced the development of a nanostructure material made of what they are calling nanocones—it is a type of nanomaterial that can be added to boost the efficiency of photovoltaics by increasing their light absorbing abilities. In their paper published in the journal Science Advances, the team describes the new material, how it works, and their hopes for its use in a wide variety of photovoltaic applications. The new cone structured material’s positive attributes come about due to an ultrahigh refractive index—each cone is made of a type of material that acts inside as an insulator and outside as a conductor—under a microscope the material looks like a mass of bullets stood up on end atop a flat base. It, like other topological insulators, exploits oscillations that occur as a result of changes in the concentration of electrons that come about when the material is struck by photons. Each cone has a metal shell coating and a core that is based on a dielectric—a material made with them would be able to provide superior light absorption properties, making it ideal for not just solar cells, but a wide variety of photovoltaic applications ranging from optical fibers to waveguides and even lenses. The researchers suggest that if such a material were to be used as part of a traditional thin-film solar cell, it could increase light absorption by up to 15 percent in both the visible and ultraviolet range. 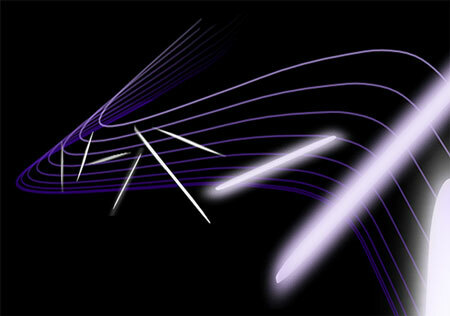 The researchers also note that unlike other nanostructures the oscillations generated by the nanocones are polarization insensitive, which means they do not have to be directionally perpendicular to nanoslits making them more useful in a wider array of applications because they can be directly integrated into current hardware. They add that they next plan to shift their efforts towards focusing on plasmonics that occur in other sorts of structures with different types of shapes. Topological insulators are a new class of quantum materials with metallic (edge) surface states and insulating bulk states. They demonstrate a variety of novel electronic and optical properties, which make them highly promising electronic, spintronic, and optoelectronic materials. We report on a novel conic plasmonic nanostructure that is made of bulk-insulating topological insulators and has an intrinsic core-shell formation. The insulating (dielectric) core of the nanocone displays an ultrahigh refractive index of up to 5.5 in the near-infrared frequency range. On the metallic shell, plasmonic response and strong backward light scattering were observed in the visible frequency range. Through integrating the nanocone arrays into a-Si thin film solar cells, up to 15% enhancement of light absorption was predicted in the ultraviolet and visible ranges. With these unique features, the intrinsically core-shell plasmonic nanostructure paves a new way for designing low-loss and high-performance visible to infrared optical devices. Silicon absorbers primarily convert the red portion of the solar spectrum very effectively into electrical energy, whereas the blue portions are partially lost as heat. To reduce this loss, the silicon cell can be combined with an additional solar cell that primarily converts the blue portions. Teams at Helmholtz Zentrum Berlin (HZB) have already acquired extensive experience with these kinds of tandem cells. A particularly effective complement to conventional silicon is the hybrid material called perovskite. It has a band gap of 1.6 electron volts with organic as well as inorganic components. However, it is very difficult to provide the perovskite layer with a transparent front contact. While sputter deposition of indium tin oxide (ITO) is common practice for inorganic silicon solar cells, this technique destroys the organic components of a perovskite cell. Now a group headed by Prof. Norbert Nickel has introduced a new solution. Dr. Marc Gluba and PhD student Felix Lang have developed a process to cover the perovskite layer evenly with graphene (“Perovskite Solar Cells with Large-Area CVD-Graphene for Tandem Solar Cells”). Graphene consists of carbon atoms that have arranged themselves into a two-dimensional honeycomb lattice forming an extremely thin film that is highly conductive and highly transparent. As a first step, the scientists promote growth of the graphene onto copper foil from a methane atmosphere at about 1000 degrees Celsius. For the subsequent steps, they stabilise the fragile layer with a polymer that protects the graphene from cracking. In the following step, Felix Lang etches away the copper foil. This enables him to transfer the protected graphene film onto the perovskite. “This is normally carried out in water. The graphene film floats on the surface and is fished out by the solar cell, so to speak. However, in this case this technique does not work, because the performance of the perovskite degrades with moisture. Therefore we had to find another liquid that does not attack perovskite, yet is as similar to water as possible”, explains Gluba. Subsequent measurements showed that the graphene layer is an ideal front contact in several respects. Thanks to its high transparency, none of the sunlight’s energy is lost in this layer. But the main advantage is that there are no open-circuit voltage losses, that are commonly observed for sputtered ITO layers. This increases the overall conversion efficiency. PolyU’ invention of semitransparent perovskite solar cells with graphene electrodes, the power conversion efficiencies (PCEs) are around 12% which is much higher than existing semitransparent solar cells. Developing transparent or semitransparent solar cells with high efficiency and low cost to replace the existing opaque and expensive silicon-based solar panels has become increasingly important due to the increasing demands of the building integrated photovoltaics (BIPVs) systems. The Department of Applied Physics of The Hong Kong Polytechnic University (PolyU) has successfully developed efficient and low-cost semitransparent perovskite solar cells with graphene electrodes. The power conversion efficiencies (PCEs) of this novel invention are around 12% when they are illuminated from Fluorine-doped Tin Oxide bottom electrodes (FTO) or the graphene top electrodes, compared with 7% of conventional semitransparent solar cells. Its potential low cost of less than HK$0.5/Watt, more than 50% reduction compared with the existing cost of Silicon solar cells, will enable it to be widely used in the future. Solar energy is an important source of renewable energy, in which solar cell will be used to convert light energy directly into electricity by photovoltaic effect. The first generation crystalline silicon solar panel is highly stable with efficient energy conversion, but opaque and expensive. The second generation solar cell, namely thin film solar cell, is light in weight and can be made flexible. However, they are made of rare materials with complicated structure and need high temperature treatments. With the research objectives of producing solar panels of high PCEs, easy fabrication, and low cost, in recent years, scientists have been investigating third generation solar cells. Perovskite solar cell as a novel third generation solar cell has attracted much attention recently due to its high power conversion efficiency, convenient fabrication process and potentially low cost. With the aim of improving PCEs and reducing costs of semitransparent solar panels, PolyU researcher has developed the first-ever made semitransparent perovskite solar cells with graphene as electrode. Graphene is an ideal candidate for transparent electrodes in solar cells with high transparency, good conductivity and potentially low cost. The semitransparent feature of the solar cell enables it to absorb light from both sides, and can be widely used in windows, facades, louvers and rooftops of buildings for converting solar energy into electricity, thus increasing the surface area for collecting solar energy substantially. While graphene as an advanced material was invented more than 10 years ago, PolyU innovated simple processing techniques for enhancing the conductivity of graphene to meet the requirement of its applications in solar cells. Firstly, the conductivity of graphene was dramatically improved by coating a thin layer of conductive polymer poly-(3,4-ethylenedioxythiophene): poly(styrenesulfonate) (PEDOT:PSS), that was also used as an adhesion layer to the perovskite active layer during the lamination process. Secondly, to further improve the efficiency of power conversion, PolyU researcher found that by fabricating the solar cell with multilayer chemical vapor deposition graphene as top transparent electrodes, the sheet resistance of the electrode could be further reduced while maintaining the high transparency of the electrodes. 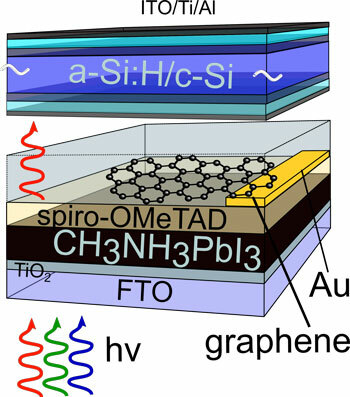 Lastly, the performance of this novel invention is further optimized by improving the contact between the top graphene electrodes and the hole transport layer (spiro-OMeTAD) on the perovskite films. Because of the excellent mechanical flexibility of graphene and the convenient preparation of the devices, PolyU’s invention can be used for the mass production of the semitransparent perovskite solar cells with printing or roll to roll process. The semitransparent solar cells will fill the gap in the market which is not achievable by the existing solar cells dominating the market. Study findings have been published in Advanced Materials, a leading journal in material science. University of Adelaide chemistry researchers are studying energy loss at the molecular level of new ‘plastic’ materials as a step towards the development of highly efficient, low-cost and flexible solar energy cells. One aim is to be able to “tune” the molecules to make them more energy efficient, thereby reducing energy loss, and able to harvest more photons from the sun. They hope one day this research could lead to applications such as whole buildings being covered with a semi-transparent, flexible window tint that would act as a giant solar cell, trapping energy from the sun and generating electricity to power the building. “Traditional solar cells used in the solar panels we have on our roof-tops are made from silicon which require a large amount of energy to produce and are expensive,” says Patrick Tapping, PhD candidate in the School of Physical Sciences. “There is a whole category of new ‘plastic’ materials, called organic semi-conductors and, like normal plastics, they are made from hydrocarbon chains or polymers. But unlike normal plastics, they can conduct electricity. “These materials are flexible and cheap to manufacture – they can be printed out as giant sheets. But at the moment they are not currently very good at turning absorbed light into harvestable electricity. They don’t transport electrons to electrodes as efficiently as they should. The researchers in the University’s Department of Chemistry ─ including Mr Tapping and his supervisors Dr Tak Kee and Dr David Huang ─ are using ultra-fast laser spectroscopy and computer modelling to “watch” the reactions occurring inside the polymer-based solar cells. Spectroscopy allows the study of matter via its interaction with light. Ultra-fast laser spectroscopy uses extremely short pulses of light, measuring the interactions at the molecular level with an electronic detector. “We’re conducting experiments and using computer simulations to look at the arrangements of the polymer chains to see how they affect the electricity-generating properties of the materials,” says Mr Tapping. Ames Laboratory scientists discovered semiconducting nanocrystals that function not only as stellar light-to-energy converters but also as stable light emitters (“Shape Evolution and Single Particle Luminescence of Organometal Halide Perovskite Nanocrystals”). Honing methods to fine-tune optimal characteristics of materials that convert light to energy may lead to more efficient materials, as performance depends critically on composition, crystallinity, and morphology. These perovskites could be used in the construction of new solar cell architectures, as well as for light-emitting devices and single particle imaging and tracking. Perovskite materials, such as CH3NH3PbX3 (X = I, Br), are known to display intriguing electronic, light-emitting, and chemical properties. Researchers at the Ames Laboratory synthesized a series of perovskite nanocrystals with different morphologies (i.e., dots, rods, wires, plates, and sheets) by using different solvents and capping ligands. The Ames Laboratory team tested the nanocrystals to explore their morphology, growth, properties, and stability under various conditions. Characterization studies of photoluminescence, like that seen with glow-in-the-dark paint, found that the rods and wires showed higher photoluminescence and longer photoluminescence lifetimes compared to other shapes. Perovskite nanocrystals with bromine were found to be particularly unstable when exposed to an electron beam during transmission electron microscopy analysis, “melting” to form smaller dot-like particles of unknown composition. Further optical studies revealed that the nanocrystals with iodine are shape-correlated stable light emitters at room temperature.